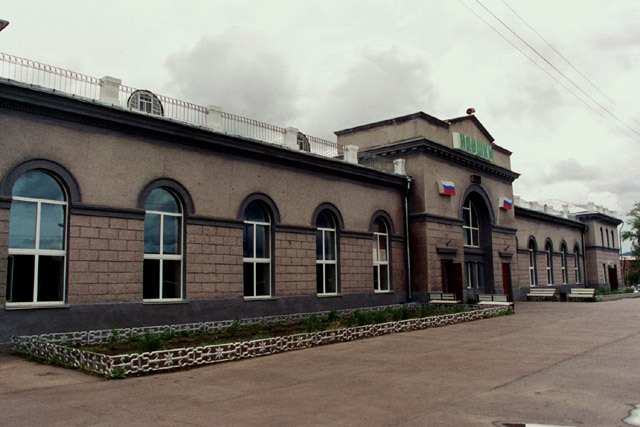 Start Irkutsk train station N52º17.461' E104º16.812' 433 meters . Aboard Train #264 (Irkutsk to Ulan Baatar) . . . .
- Russia - Mongolia border (Naushki/Sukhbaatar) . . . . 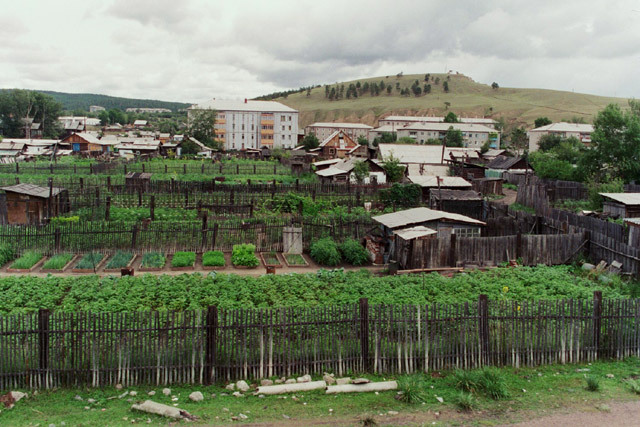 Weather: Began overcast with light rain in Irkutsk, then slowly cleared to partly cloudy with occasional sun. Cool. We have a couple of hours in the waiting room to hang around for our train, so we do some reading and relaxing. Lars almost finishes off the latest installment in the Harry Potter saga, but will have to wait for the train ride to get to the climax. Just after 8 PM, we decide to find out which platform our train is at and to head over there. We struggle with our bags down the stairs to the underground passageway and make our way up to the correct platform. We have finally figured out their numbering system of platforms and tracks, so we make no tiring mistakes. We board our train, no. 264 to Ulan Baatar, and settle into our compartment. We are traveling second class (all that is available), and as our agent had recommended that we buy up the whole compartment due to the local traders that can overfill it with their goods, we took him up on his advice. So, we secured the upper bunks and made ourselves as comfortable as possible. Bags were put away, sleeping clothes brought out and food stocked. 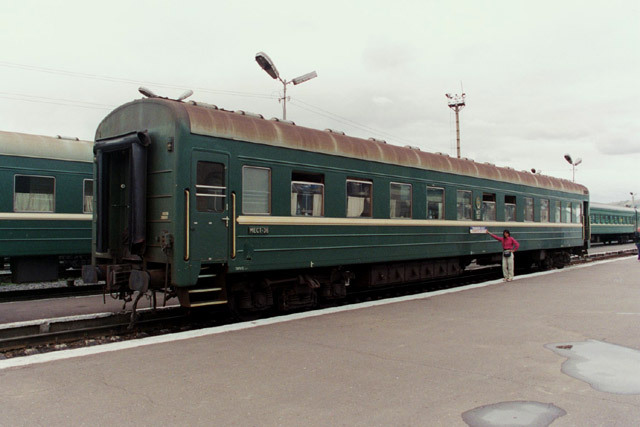 This train, while similar to the Russian trains, was a bit more basic, but comfortable. A interesting difference was the samovar - here it is wood-fired, rather than electric. The car was filled with a group of German tourists - they were a bit noisy and seemed to be taking shifts in keeping the corridors busy and loud. About an hour after getting on the train, our dinner was ready. We had heated up some of our beef curry and had it with bread. Then we just relaxed and sat back and enjoyed the ride. But we soon realised why this train is going to take so long to get to Ulan Baatar (besides the border crossing) - we seem to stop at just about every small village along the way. There are so many stops, we did not even try to keep track of them. One of the more interesting stops was at Slyudyanka 1 - 2320/1820 - KM 5,312/127, where we had stopped on the way in to Irkutsk. We wanted to see if we could find any fresh berries to eat on the train. We pull into the station and as the doors are opened the many ladies selling their wares crowd up against the train. The only problem - they all seem to be selling only fish. We look from basket to basket - fish after fish. Just as we are about to leave the station, we find one lady with fresh strawberries. We are able to get a large cupful before the doors are closed and we pull away from the station. It is then time to head off to sleep. We spend the morning hanging out in our compartment - no where to go. 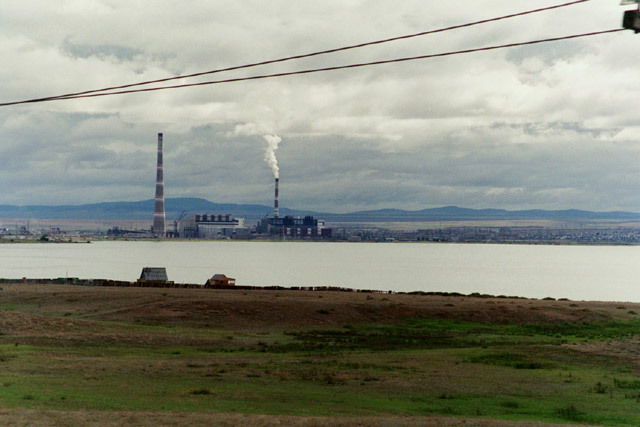 We had stopped at Ulan Ude, a dreary industrial town, early in the morning - we recall this from a half sleep - and the cars were shifted around. 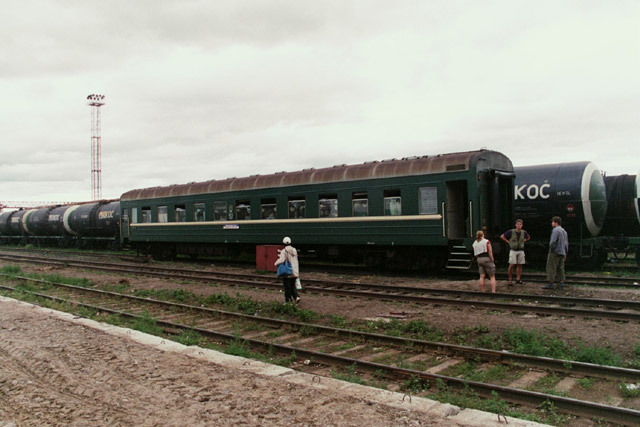 We are now the last car in the train and we have turned south and headed towards Mongolia. 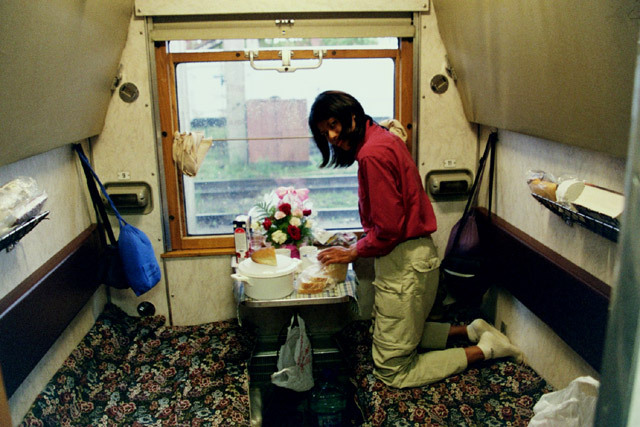 We have breakfast in our compartment and the ride is very slow. Many frequent stops on the single track. The sun begins to peek through the clouds as we pass along Goose Lake, a long lake that the train follows for some time. One of the longer stops is at Gusinoe Ozero - 1110/0610 - KM 5,780/194, which has a nice, small wooden green station building. We then pass along a river and up a valley. We decide to have lunch before we arrive at our next stop - the Russian border. We arrive at the border station, Naushki - 1310/0810 - KM 5,902/717, and, well, wait and wait. We are able to get off the train and wander around the platform and take pictures. 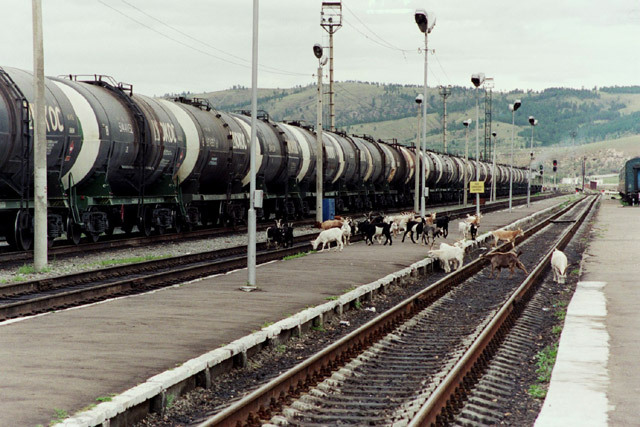 We are amused by the goats that wander into the station and across the tracks, eating whatever they come across. At one point, a lady comes around and hands out some forms for us to fill out. We can tell that we are not going anywhere fast. We have been shunted here and there. All other carriages and the engine have been removed from our car and we are sitting there, a little forlorn, all by ourselves on the station platform. 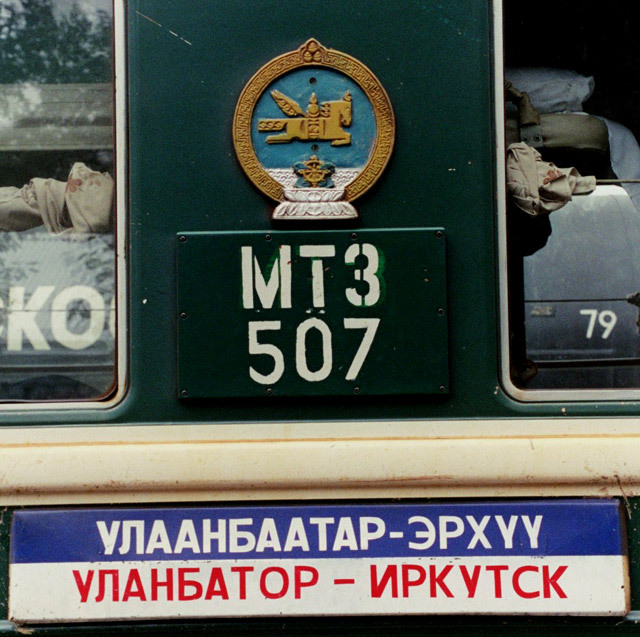 Tourism and travel between the Russia and Mongolia must be down - only one car crossing the border. We spend hours there. We write some postcards and run off to the the village post office (outside the station) to post them. Finally, four hours after arriving at the station, some officials come by and collect our passports. Then a short while later some other officials come by to check our compartments. They have torches and open whatever little nooks and crannies that exist. We have to leave the compartment while they do this, but it is very professional. They then return our passports and our customs forms. They do nothing with them and do not even ask for the ones we filled our when we entered. Finally, just after 6 PM the train moves off, or rather, just our one car with a small engine pulling it. We have a few kilometers to drive to the actual border and then to the Mongolian immigration post. While we are slowly crawling along, we open the window and peek out to get a better view. We are quickly told to get our heads back in and keep them inside. The border is demarcated with a tall electric fence and we can see the dirt track that parallels the fence wind its way off into the distance. Just on the Mongolian side of the border, we make a brief stop at a log cabin, red with blue trim, with a funny observation post, painted in camouflage colors, stuck on top. A guy jumps on the car and hands out customs forms and the we once more move off. 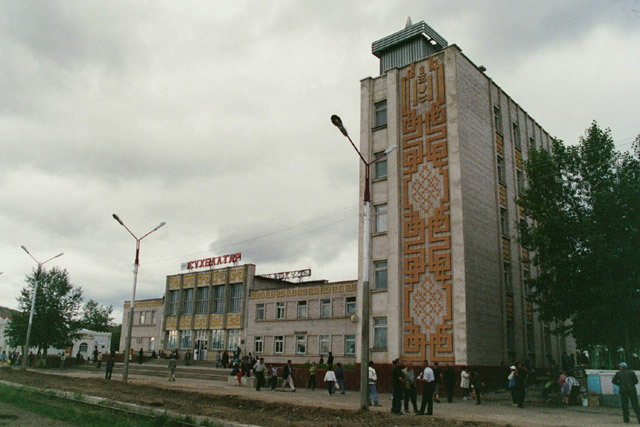 It takes a further half an hour for us to reach Sukhbaatar - 1900 - KM 21 (the kilometers now refer to the distance from the Russian-Mongolian border), the Mongolian border town. Our single car is once again left to sit all by itself on the track. The officials get on the train and we are given more forms to fill out. Our customs form is stamped and given back to us. Our passport is quickly checked and then stamped. It is then time to wait. 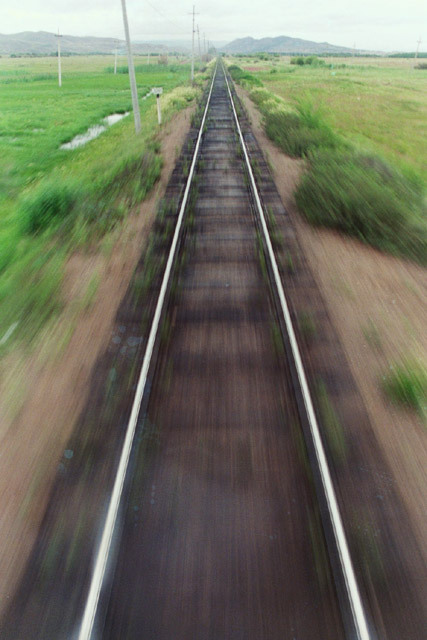 We can get off the train and wander around. It is a bit of a run-down, dreary place. Money changers, carrying wads of cash and calculators, crowd the train and try to get us to by some Mongolian togrogs, but we will wait. We wander around, in no fear that the train will leave soon - we still have no engine. Some soldiers walk by - they seem to be wearing uniforms that the Soviet army used in the Second World War. They are incredibly faded and worn out. After a while, an engine is hooked up to our car and they move us here and there and eventually our one car becomes the center piece of a series of cars. We are once again a real train and we finally depart this border town at 9:20 PM. It has taken us over eight hours to get across this border and get on our way. As the light slowly dims, we begin to see the gers (or yurts) dot the landscape. We have dinner as soon as possible, in order to get ready for bed. We have an early arrival in Ulan Baatar tomorrow morning. We are up just before 6 AM and get our stuff ready. We seem to be a bit delayed and just hang out in our compartment until we see what looks like the city. The group of Germans has taken over the corridor with all their bags and themselves. They seem to be very afraid of missing the station - we try to tell them that the train stops there for like 20 minutes and not to worry, but they spend over 45 minutes just standing out there, all ready to go. We decide to have another cup of tea. 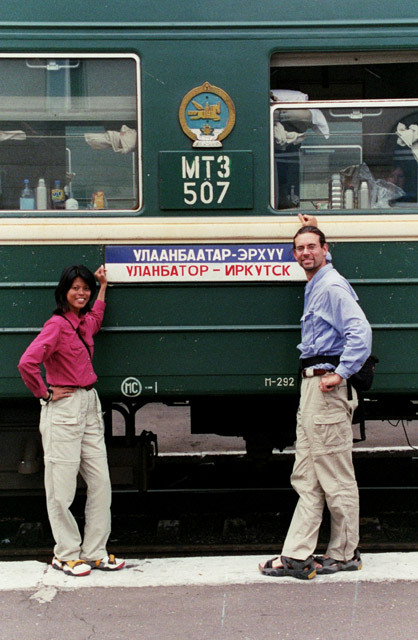 The train finally pulls into the Ulan Baatar - KM404 train station at 6:30 AM and we take our time unloading all our bags. It takes a couple of trips. We are looking forward to getting rid of some of this stuff in Mongolia (namely the food that we have brought with us). We are met at the platform by Bolod, the agent who we have bee coordinating with about our trip in Mongolia.